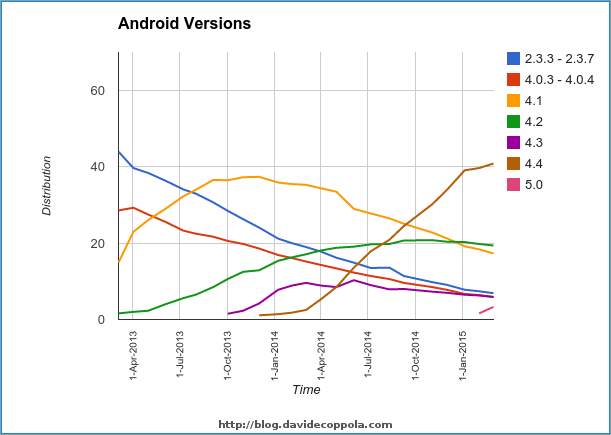 First update of the year of my series of posts dedicated to tracking and analysing the Android version distribution over time. The time frame considered in this update covers the last 2 years of Android: March 2013 to March 2015 and it’s the first one with data on Android Lollipop. I should probably point out that since August 2013 this data is gathered from the new Google Play Store app, which supports Android 2.2 and above, devices running older versions are not included, but at that time they accounted for about 1% of devices that checked in to Google servers. Version 2.2 (Froyo) seems to be stable on a 0.4% market share. Version 2.3.3 – 2.3.7 (Gingerbread) keeps losing share, but more slowly than I predicted, that’s probably due to all the (old and new) low-end Android devices which keep using it. Version 4.0.3 – 4.0.4 (Ice Cream Sandwich) keeps going down and will probably disappear before 2.3. 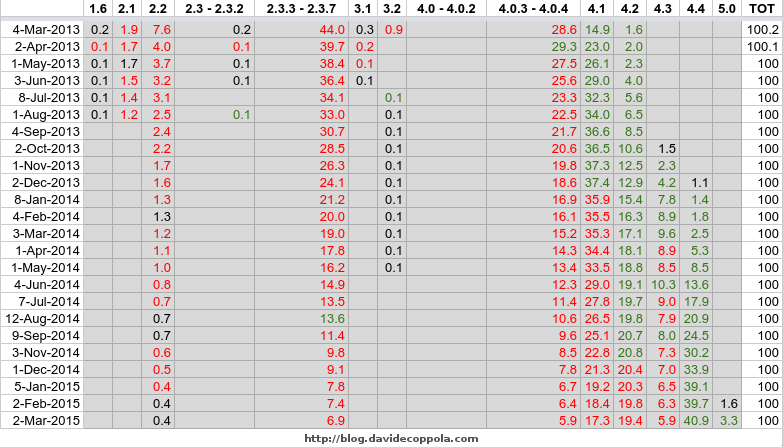 Version 4.1 (Jelly Bean) is losing market share at a stable rate now (about 1% each month). Version 4.2 (Jelly Bean) is slowly declining, but it will take a long time for it to disappear. Version 4.3 (Jelly Bean), in a similar way of 4.0, has started a faster decline in the last month and if it keeps like this it won’t be out for long. Version 4.4 (KitKat) has not passed Jelly Bean yet, but this might happen next month. Version 5.0 (Lollipop) despite being officially released in December 2014 has entered the chart only in February 2015. Now it’s showing a good increase respect last month, especially if compared to KitKat’s first months. To have a better visual understanding of the data I’ve also created a graph of the evolution of the 6 main versions over time, these are the Android versions with more than 1% of market share which overall cover 99.6% of the Android market. Overall Jelly Bean is still the most used Android version with a 42.6% of market share, but it has dropped 6.1 points in the last 3 months and there’s a good chance KitKat will take the lead of the Android market soon and that Lollipop will also take a good chunk of it in the following months. Furthermore, Google is rumored to be releasing Android 5.1 this week, so things could look quite different in the next update!